There are many types of data that we come across in our daily life. For example, we need to handle data such as names, addresses, money, date, stock quotes, statistics and etc everyday. Similarly in Visual Basic 2010, we have to deal with all sorts of of data, some can be mathematically calculated while some are in the form of text or other forms. VB2010 divides data into different types so that it is easier to manage when we need to write the code involving those data. Visual Basic 2010 classifies the information mentioned above into two major data types, they are the numeric data types and the non-numeric data types. Numeric data types are types of data that consist of numbers, which can be computed mathematically with various standard operators such as add, minus, multiply, divide and so on. Examples of numeric data types are your examination marks, your height, your weight, the number of students in a class, share values, price of goods, monthly bills, fees and etc. 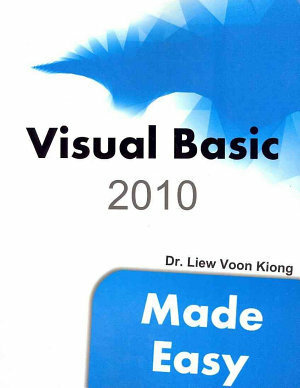 In Visual Basic 2010, numeric data are divided into 7 types, depending on the range of values they can store. Calculations that only involve round figures or data that don't need precision can use Integer or Long integer in the computation. Programs that require high precision calculation need to use Single and Double decision data types, they are also called floating point numbers. For currency calculation , you can use the currency data types. Lastly, if even more precision is requires to perform calculations that involve a many decimal points, we can use the decimal data types. These data types summarized in Table 6.1. Literals are values that you assign to a data. In some cases, we need to add a suffix behind a literal so that VB2010 can handle the calculation more accurately. For example, we can use num=1.3089# for a Double type data. Some of the suffixes are displayed in Table 6.3. Variables are like mail boxes in the post office. The contents of the variables changes every now and then, just like the mail boxes. In term of VB2010, variables are areas allocated by the computer memory to hold data. Like the mail boxes, each variable must be given a name. To name a variable in Visual Basic 2010, you have to follow a set of rules.